For the third and last of my operatic nights in Paris, I remained with the Opéra national de Paris, but moved across town from the Bastille to the Palais Garnier, famously ‘in the style of Napoleon III’. Christoph Marthaler’s production of Katya Kabanova was on the menu. The Paris Opera had not staged Katya until as recently as 1988, in Götz Friedrich’s production, though the Belgrade Opera (!) had presented it in 1959 at the Théâtre des Nations, and the Opéra-Comique had offered a French-language version in 1968. 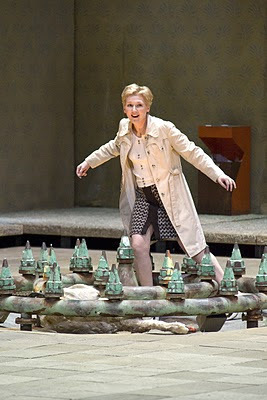 Marthaler’s production was first staged at the Salzburg Festival in 1998, and came to the Palais Garnier in 2004, moving from one Gérard Mortier stronghold to another; it is encouraging to note that Nicolas Joel has not turned his back on every aspect of Mortier’s rule. It is also worth noting that it took Mortier to bring The Cunning Little Vixen to the Paris Opera: I saw the first, rather wonderful production only three years ago! The longtime neglect of Janáček, whether in France, Britain, or elsewhere, is truly baffling, yet it persists, giving all the more reason to be thankful for this Katya. I am not sure why Marthaler’s production has been performed at the Garnier rather than the Bastille; Friedrich’s, apparently, moved to the latter on revivals. Whether this were the intention or no, the contrast between the Garnier’s preposterously lovable extravagance – music almost seems beside the point – and the mise-en-scène was stark indeed. I can hear some readers groaning at the mere mention of a drab Eastern European apartment block, here powerfully evoked by Anna Viebrock’s set designs, but the test is whether the setting works. For the most part, I think, it does. The original Ostrovsky play, The Storm, and the opera are both set in a mid-nineteenth-century Russian provincial town, but the ‘provincial’ is more to the point than the ‘mid-nineteenth-century’, and even that could, I imagine, readily be translated into the suburban. The closed moral world of the apartment block’s inhabitants and their hypocrisy are searingly portrayed, choral hymn singing emanating and visible from one of the flats above. Indeed, one of the great virtues of this production is a chance to observe some of the goings-on elsewhere, whether from the ‘virtuous’, the potentially sympathetic (the violin soloist, not in the orchestra, but practising at his window), or the drunk (comedian, Ulrich Voss, whose shouting and staggering at the beginning of the third act will not have been to all tastes). Their uniform turning away as Katya’s torment moves her toward suicide is simple, powerful, and terrifying. There is, perhaps loss in that we never reach the Volga, yet claustrophobia is heightened by Katya drowning herself in the block’s courtyard fountain. I also found it a little confusing that characters exited through what appeared to be a wardrobe (this is hardly Narnia! ), but not to worry. Tomáš Netopil led the orchestra with considerable verve, although tension was not always maintained as it might be. The sheer orchestral delight and dramatic fervour of a conductor such as Sir Charles Mackerras is not his – yet. Angela Denoke was suffering from some ailment, according to an announcement made prior to the performance. I should never have been able to tell, for hers was a powerful portrayal indeed. Katya’s goodness shone through, yet never in an unbelievable way; one also knew that this was a woman, and a woman with needs. I believed in every word and every note she sang. Andrea Hill and Ales Briscein make for a winning couple as Varvara and Kudrjas, bright of tone and manner, though Varvara’s dancing threatens to irritate after a while, however much it may be intended dramatically to distinguish her from the stifling ‘morality’ of her environment. Not every performance was so impressive, though. Donald Kaasch passed muster as Tikhon, but sometimes sounded vocally as opposed to dramatically weak. (It did not help, moreover, that he looked more like the Kabanicha’s husband than her son.) Jorma Silvasti’s Boris lacked necessary allure: one needs to have some sense of what might attract Katya to him. However, as so often, the Kabanicha threatened to steal the show, yet creditably did not quite do so. What a truly appalling character she is! We do not, it is true, know what has made her like that; whether it was something akin to what Katya herself suffers must remain speculation, though one cannot help but wonder. Be that as it may, her viciousness seems almost unparalleled in all opera. Jane Henschel quite made the character her own, no mere caricature, all the more malicious for presenting a properly sung portrayal. Interestingly, she will be singing Mrs Sedley at Covent Garden later this season: the more vicious the society... Her outdoor exhibitionism with Vincent Le Texier’s nasty Dikoy points up the hypocrisy nicely; she knows exactly what she was doing when she waves at the neighbours. Once they have withdrawn to her apartment, a quick spurt from the water fountain suggests that all is over as quickly as one might expect. The selfishness of the character is almost ritually enhanced by periodic retreats into her bedroom, where she will turn on the television or listen to the radio, eat some chocolates, lie down on the bed, and play with a squeaky toy. Production and performance work in tandem. I was in two minds as to the delivery via loudspeakers of the choral singing at the end being. The effect was alienating, but I am not quite sure that gain outweighed loss. More importantly, however, I was profoundly moved by the performance as whole, once again marvelling at what a masterpiece this is. 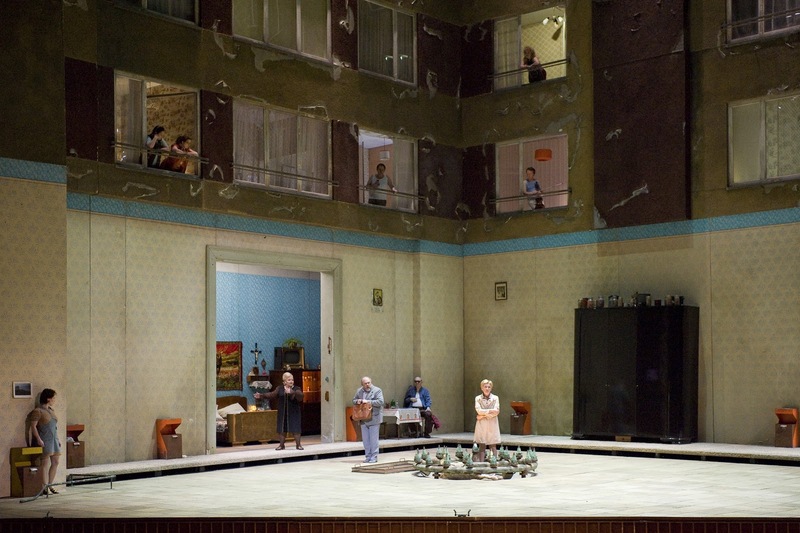 Marthaler will soon be directing more Janáček, in the guise of The Makropulos Case at this year’s Salzburg Festival, a production to which I look forward greatly. For those interested, his production is available (with Denoke and Henschel) on DVD; I have not seen the performance. Great to read your report here. My only remaining problem with this production was the insertion of the a cappella choruses as interludes. When Janacek himself is so concise, why add? Good to see Denoke goes from strength to strength and that Jorma Silvasti is in the cast. A shame that Covent Garden has not continued its support of this strong artist. He was remarkable in The Greek Passion and Jenufa. You are doubtless right concerning the interludes, whose status I should probably have made clearer. I didn't mind them on this occasion, but suspect that the effect might wear thin on repeated listening. Silvasti is due, by the way, to sing in Jenufa at the Vienna State Opera. I suspect I just caught him on a less impressive day.